Have a real Christmas and an authentic New Year! What if you were able to catch yourself and stop making those initial automatic comparisons? Instead of this downwards spiral making your negative mood more deeply entrenched, what if you could be more accepting towards your initial low mood? Instead of making things much worse by judging, comparing and trying to intellectualise your emotions, you could just try taking a positive action to help yourself feel better – or just wait for the experience to pass. Learning to recognise and catch yourself when you start to feel this way can help you to prevent things getting worse. You can do this by accepting the initial feeling and giving it an opportunity to pass without trying to ‘solve’ it through thinking. Have a look at my Mindfulness series for more detail – particularly week two. This automatic comparison is something that I do all by myself, without any external pressure – people who have or have had depression have a tendency for it. It’s also something it is really easy to do without recognising you are doing it, or even thinking about it. Before you know it you’re feeling low and you don’t even know exactly how you got there. But there’s more fuel for making comparisons these days than there has ever been before. Now we also have the projected experience of others to contend with. Social media, particularly Facebook, gives people an opportunity to project the version of their life that most closely fits their ‘ideal’ to their friends, family and acquaintances. As well as having an internal image of how our lives ‘should’ be that we constantly and automatically compare to our actual experiences, we’ve got an external (although probably equally unrealistic) image of how everyone else’s lives are. And from this point, the negative spiral of judgement to internal recrimination to anger, frustration and misery can be the same. I was thinking about Christmas and mental health recently and it struck me that the Christmas season is a time when even people who don’t usually suffer from depression are much more at risk of the negative spiral that can be triggered by making comparisons. 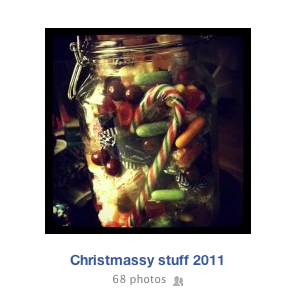 What do you mean you don’t have a jar of Xmas sweets at your house? Just look at the way the media, the shops and the advertising companies celebrates Christmas. For well over a month, we are bombarded with images and ideas about what the perfect Christmas should be. As far at the media is concerned no one is lonely, no families fight and everyone is cosily wrapped up in warm woollen knits. The most untoward thing that might happen is a teenager won’t wear his Christmas hat, or a mother gets slightly flustered over the turkey. Never mind though, everything is almost instantly resolved with a hug and a rueful look. Day in day out over the Christmas period we are almost forced to make that comparison between our lives and feelings and what we’re being told they ‘should’ be. And we often respond by trying to create that and sharing our creations on social media – which makes us feel better about our experience. This picture of me in a woolly scarf drinking a mulled wine matches how things ‘should be’ at Christmas. Look, my experiences matches! Which in turn just feeds the external pressure that others are feeling. As a society, we’ve created a story of Christmas told through our television screens, shop windows and advertising and kept fed through our own attempts to recreate it on social media. But in fact, things are not that way. Experiences in those few weeks are as varied as there are people. No one experiences the ‘media’ Christmas. Things always fall short of that because that version of the world doesn’t exist. We are being forced to measure our experiences against something fake – and when they fall short, we can easily make ourselves feel worse by allowing that negative spiral of thoughts and judgements to get in. I attended a course that taught me how to respond to the automatic comparisons and judgements that characterise depression. I thought that maybe there is something there that could help everyone during what can be a really difficult and challenging time. This year, have a real Christmas. It might not be great, it might be mainly a lot of fun, it might be totally rubbish – but however it goes don’t make it worse by letting yourself get sucked in to comparisons. One of the most important things is recognising and catching yourself making these automatic comparisons. Writing them down when you find yourself making them can help you to view them as intrusive thoughts rather than reality – and help you next time they start to catch hold in your mind. Recognise that it’s a fantasy world being created and identify everything that is feeding into it. If you find yourself scanning Facebook and feeling jealous or inadequate then you’re making comparisons and are at risk of that negative spiral. Remember that those people are representing their lives – in the same way that the media tells us the story of how we should be experiencing the season. Adverts in particular are very insidious and a sense of how things ‘should’ be at Christmas can sneak its way into your brain however hard you are trying. 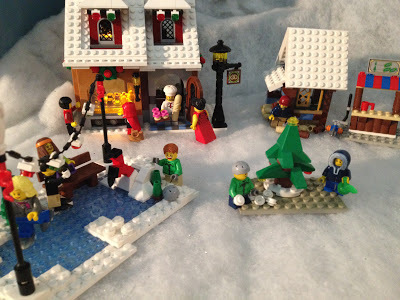 Next time you see a Christmas advert, imagine them all made of Lego or painted in watercolours. This way it’s easier to recognise that they’re telling a lovely story, but that’s all it is, a story. Not seeing them as real humans can help prevent us from making these comparisons. Mindfulness talks about taking a ‘breathing space’ to stop that thinking and refocus your awareness on the here and now. This isn’t always easy, but there are things that can help you to keep a clearer head. For me, alcohol makes a massive difference. If I drink more that perhaps a couple of glasses on a night, I really notice its impact on my mood and ability to manage it a couple of days later. Everyone has to manage their own relationship with alcohol, hormones, food and sleep – but at least recognising their influence can help you regain control of that mind spiral. In addition, the Mindfulness series I linked to earlier can give you some tools to help become more aware of both how your mind is acting and what actions you can take. This Christmas enjoy any good moments and when you find things difficult, move away from making comparisons and be gentle with yourself. Try not to make it worse by letting yourself get sucked into comparing it with a fantasy. Good luck – and don’t beat yourself up if you do find yourself making those comparisons more than you want to – we all do it and it is not an easy thing to stop! P.S – I updated this article slightly for 2013 – you can read that version here. Despite ridicule*, those letters still get enclosed with Christmas cards, and they, too, can often make out that everything is rosy for Rosie and Sam (see below), and therefore your experience is not only a failure to achieve, but also your fault that you aren’t as happy as they obviously are ! * Sam has been busy boiling his head this year, whilst Rosie has found pleasure in relaxation, a way of getting away from John’s ‘chemistry’ experiments and Judith’s new-found passion for tennis (nothing to do with Jim M.! ), etc., etc. And no one explains who this unnamed narrator, not part of the family, actually is!